We just had a great chat with Lee Hinson-Hasty! Lee is the Senior Director of the Theological Education Funds Development for the Presbyterian Foundation and a lot of us probably remember him from his days at PMA as the coordinator for Theological Education & Seminary Relations. Needless to say, Lee knows what he talking about. He shares stat-after-stat presenting a stark reality that we are only beginning to fully realize, but then he also gives us some hope and suggests some ways that we could help. We had a problem showing the Powerpoint slides during the video, so you may want to scroll through the Powerpoint before watching. Below is the PDF version of his Power Point, the Presbyterian Outlook article that first introduced us to a lot of his concepts, and a link to Lee’s website at the Presbyterian Foundation for even more info as well as other ways to follow-up. I grew up thinking faith was all about doing the right thing and not messing up. I felt I needed to earn God’s attention, love, and grace. I reduced Christianity to a list of rules and put God at the top of a staircase I was determined to climb. I was quick to judge, was shamefully proud, and constantly feared my own failure. I am not sure how or when all of this began to shift in my mind, but eventually I came to realize that I didn’t have to earn God’s love. Time and time again I was humbled by the experience of God’s grace. I fell into new depths of gratitude and discovered that holiness was not good marks on a chalkboard but a gift. This gift nudged me away from the values of the world and toward God’s values of love, gratitude, and faithfulness. This fundamental shift in my understanding is what brings me to this holy calling this Lenten season. Ash Wednesday marks the beginning of Lent. We have been in “ordinary time” according to the liturgical calendar, but will soon no longer be the case. We are about to enter into 40 days and 40 nights of preparing ourselves for this long Lenten walk to the cross and beyond. Lent is a season set apart. Lent is a season specifically set apart for a reason. And I believe the reason for this Lenten season is for us to respond to this fundamental shift as well as our holy invitation issued to us by our Holy God. I do not believe this is an impossible command beyond our reach. Rather, I believe this is our scriptural invitation to live the life we were created to live. A life filled with joy and wonder. A life filled with purpose and hope. A life filled with belonging and potential. Whether this is all brand new to you or whether you simply want to be more intentional in the Spirit’s sanctification this season – I would encourage you to join me on this holy journey in this Lenten season. This all stems from a book I wrote last year for Chalice Press entitled, BE HOLY. You can order a copy through the publisher or Amazon or B&N or AbeBooks … or you could simply read more about it here and wait for the audiobook to be released within the next month. 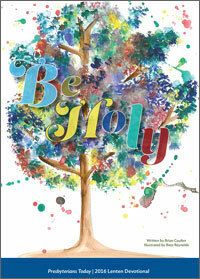 That book is what led Presbyterians Today to ask me to write their 2016 Lenten Devotional also entitled “Be Holy”. You can order copies of that here or you can read them online each day via twitter or facebook. Each day includes a Scripture passage, a reflection on what it means to be holy, and a breath prayer to carry with you throughout each day. PC(USA) pastor and author, Mihee Kim-Kort, and I have partnered together to create a special 8-episode series on her podcast THIS EVERYDAY HOLY which begins this Ash Wednesday and goes all the way through Good Friday. You can listen to the episodes here or download them through the iTunes store. I have also partnered with videographer Scott Pardue to produce a couple of videos based on the three main sections of the book that are inherent within our calling to BE HOLY: 1) Find Identity, 2) Find Belonging, 3) Find Purpose. These will be released throughout the coming weeks as they are ready and Lord willing! I am glad you have begun this journey, and I am honored to go on it with you. Lent is a sacred journey that has been set apart—a holy journey that we are invited to take with our Holy God. been in a committee meeting when there was total silence because no one in the room volunteered to help with a role/task? worked with a committee or board and heard someone say—with a grimace or shrug, “I’m already over-committed; I really don’t have time to do any of this!”? heard someone whisper to a neighbor, “I was told that this was only going to take an hour of my time each month!”? I cannot tell you how often I have heard church members utter the phrase, “It’s only an hour each month!”—either in trying to convince someone to join a committee or recalling what they were told when they were asked to serve on a committee, or as a church officer. I don’t think we do anyone justice—the person serving, the committee or board, or the church as a whole—when we set our expectations so low. And I don’t think we’re being honest. The church is the people! (Remember the finger rhyme? “Here is the church and here is the steeple; open the doors and see all the people!”) Pastors, educators, and other church staff cannot and should not be doing all of the work for the people. 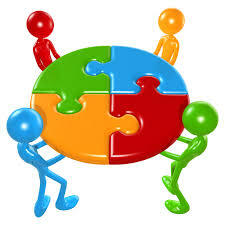 We are called to work as partners in ministry, working together to accomplish the vision and mission of the church. Often, the staff are called to train, empower, and manage the volunteers/church members, and it is the church members themselves who are called to do the work, to be the church. I get it. Many people are over-committed. The demands on young people and their parents keep growing. We pay the staff—can’t they take care of it? In desperate times, we want to use desperate measures. But having a name on a list “to fill a spot” or a warm body in a chair is not helpful when it comes to doing the work Christ has called us to do… together… as a team. Having church members attend meetings only to pat our backs or offer praise is not really helpful. 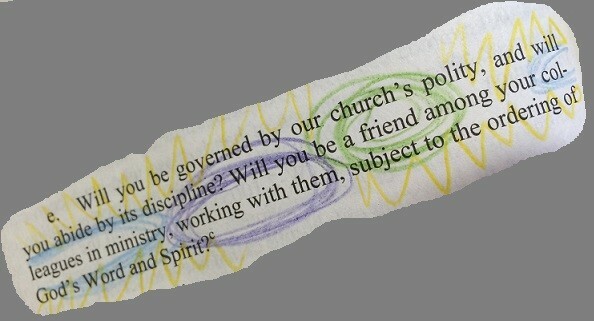 This is not what it means to be partners in ministry. We have expectations for committee members, church officers, and other volunteers, but I don’t think we always communicate those clearly and upfront, before someone accepts a position to serve. When we “convince” someone to join a committee or serve as a church officer, we may be getting in the way of the Spirit. We may be forcing something that isn’t helpful or fruitful or honest in the long run. Let your Yes be Yes and your No be No. None of this is meant to blame or shame people; we need to make it clear that after prayerful consideration, an honest response to a call to service is what we want. I appreciate honesty, and I really appreciate when someone tells me after prayerfully considering a position or task that they are not able to faithfully fulfill that role at the time. Just as there is a time and place to say “Yes,” there is a time and place to say “No.” In his sermon on the mount, while speaking on vows or solemn pledges, Jesus said, “Let your yes mean yes, and your no mean no. Anything more than this comes from the evil one” (Matt 5:37, CEB). It is ok to say “Yes” to serve when you understand what is being asked and feel called to make that commitment. It is equally ok to say “No” to serve when you just don’t feel called in that time and place. This is truth-telling, and it is a spiritual discipline. Committee Descriptions/Expectations. We should have clear expectations for all volunteers, and this includes committee members. It’s not fair to ask someone to make a commitment to serve if we haven’t told them up front what we actually need and/or expect. Committees should have a description form that might include: the church’s mission statement, the purpose of the committee, the responsibilities of each member (including the meeting time and place, but also including a list of tasks to be completed throughout the year), accountability, and budget. This type of description form can be a tool when recruiting new members; after reviewing the description and expectation, the person can give an honest answer about their ability to serve. Training. We (church leaders) need to make sure we provide training to our volunteers: teachers, facilitators, nursery staff, worship leaders, mission coordinators, ruling elders, deacons, etc. Again, we don’t set ourselves up for success if we aren’t explaining expectations, providing background information, giving examples, and laying out process. Empowering the Laity. My colleagues and I have often said that our goal is to work ourselves out of a job. If we are truly empowering the people to be the church, then at some point in the future, we may no longer be needed. If people took such ownership in the ministry of the church and shared the burden among the group, what a vision of the kingdom of God that would be! I think pastors, educators, and other church staff do bring a wealth of knowledge, experience, pastoral care and guidance, but the people should be empowered to be the hands and feet of Christ: to minister, to share the gospel, and to use their God-given gifts of energy, intelligence, imagination, and love. Let vacancies stand. This one can be really difficult for us perfectionist-types, but it can also be really important. After diligently working to fulfill a position, if a vacancy still exists, allow time to pass for people to see the vacancy and wrestle with whether or not they might faithfully commit to the position. Allow some of the tasks to go undone. This might also create space for a new vision to emerge: should we keep doing what we’ve been doing, or is the Spirit calling us to something new? Sometimes, having less people calls us to open our hearts and minds to God’s presence and to imagine what re-creation might be coming forth. This can be really, really good. My prayer is that we seek ways to truly serve as partners in ministry. What if we start ed by saying, “It’s only an hour for the meeting each month, and then you can choose what tasks you are able to help with and what projects inspire you to lead between meetings!”?